As expected, Apple announced a new addition to the MacBook family. Starting today, a 13-inch Macbook Pro equipped with the Retina display will be available to consumers. The newest installment of Apple laptops got a full refresh from past Macbook model. In standard Apple fashion, it did it’s best to fit more in less. The first noticeable change comes in size. The Macbook Pro with Retina display measures in with a .75-inch thickness, making it 1/5th thinner than the older model. This new thin look translates to the weight as well. 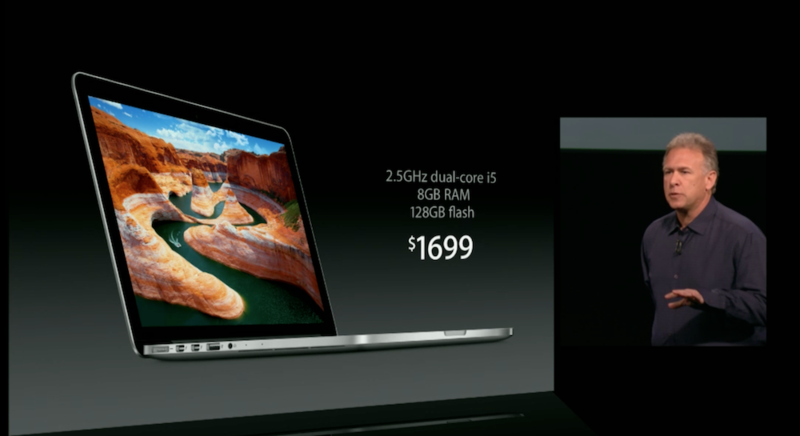 Apple says this is its lightest Macbook ever, weighing in at 3.5 pounds. The changes continue inside the new Macbook Pro. A new standard of 8GB of RAM comes loaded in to the laptop, along with an optical drive. The processor will be a Core i5 or i7 and the system will be powered by asymmetric lithium-ion batteries. Hard drives are available with up to 768GB of storage, which will a be solid state drive. The computer will feature stereo speakers, pushing sound out from each side, and dual microphone plugins. A new HD camera will broadcast your FaceTime sessions. Of course, the main attraction here is the Retina display. Apple has always been proud of it display, and this one is no exception. Phil Schiller showed off the display, bragging of its 4,096,000 pixel display. By comparison, he said that is almost double the pixels of an HDTV. The numbers delivered were impressive, including a 29 percent higher contrast ratio, 75 percent reduced reflection, and IPS panel that gives a 178 degree viewing angle. The standard model of the Mackbook Pro with Retina display will come with 8GB of RAM and 128GB of flash storage for $1700. Other models are also available, all starting today. Expect to see ads for the computer run during the holiday season about as often as political ads are running now.